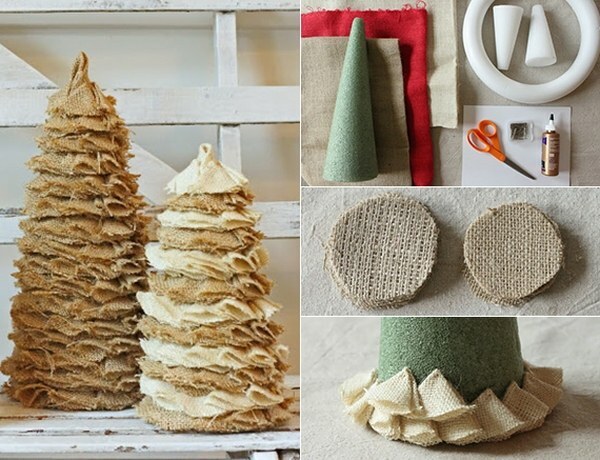 A burlap Christmas tree, ornaments, tree skirts, toppers, garlands – all these can be crafted to decorate our homes for the holiday season and we selected some of the best burlap festive decoration ideas to inspire you for the coming holidays. 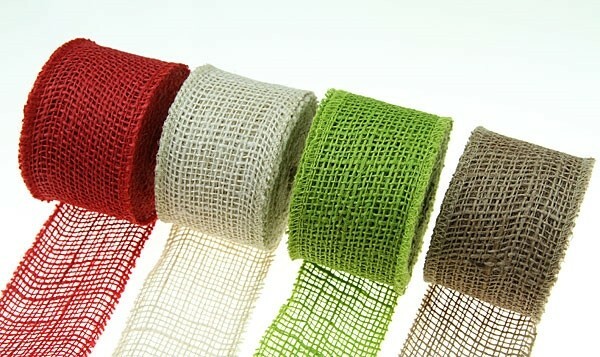 Burlap is an almost versatile material and can be used for numerous items – from curtains to upholstery, packing bags even gift wrapping and this is one of the main reasons for the popularity of the fabric among artists, designers and decorators. 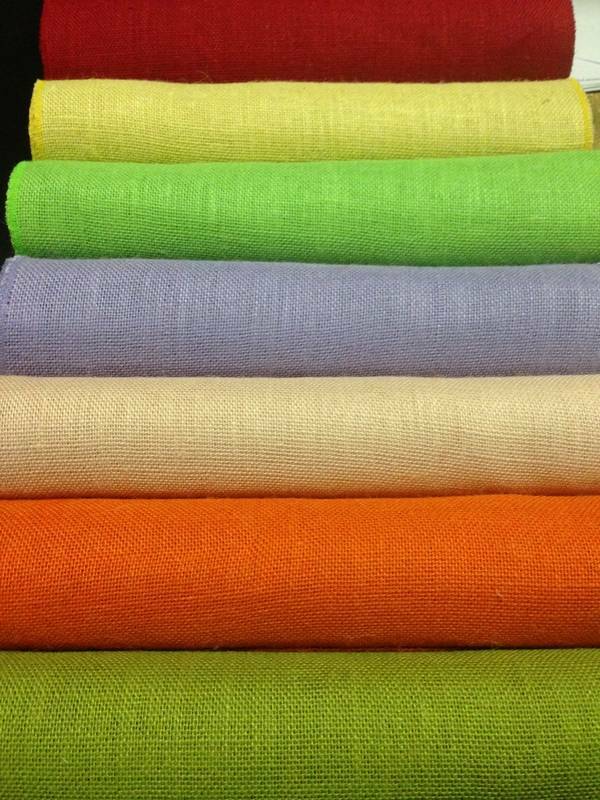 It is environmentally friendly material and a great choice for various craft projects and interior decoration. 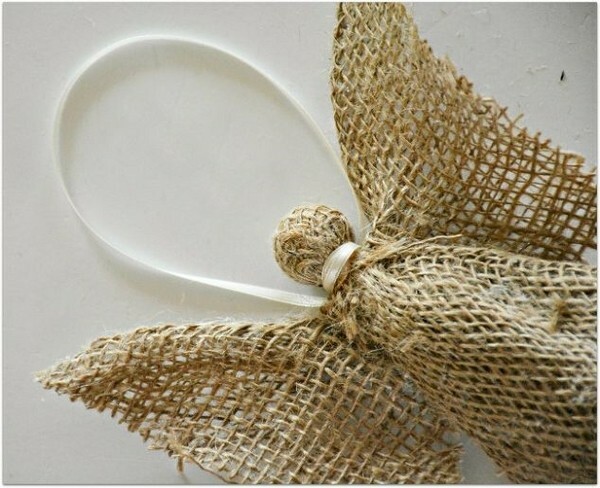 Burlap fibers are relatively coarse and after being cut, the stems of the plant are soaked in water for several days, and only then sent to a plant for further processing. The result is a strong fabric which is at the same time very flexible and durable. 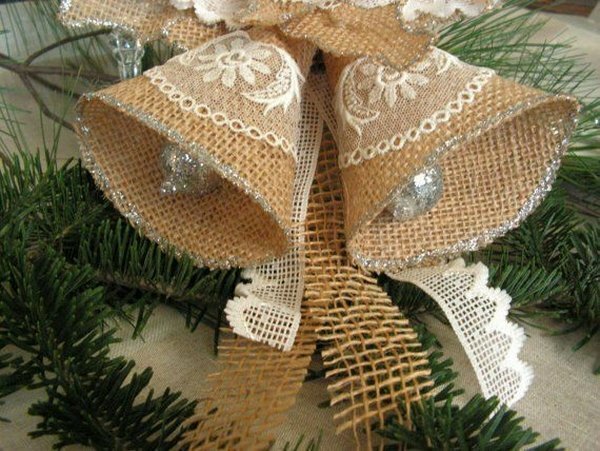 Burlap Christmas tree ornaments are the perfect choice for those who are attracted to the rustic style or the primitive holiday decorations as well as all those who love nature and prefer ecological materials. 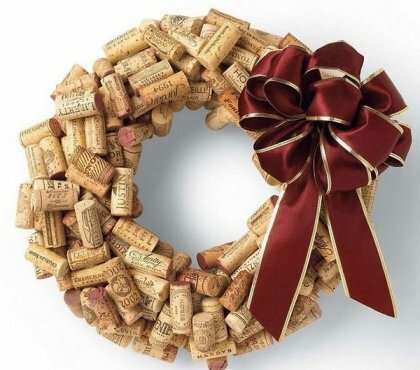 One of the most distinctive features of the rustic style is the simplicity and naturalness of the materials used in the decoration which brings a special warmth and charm to the festive atmosphere. 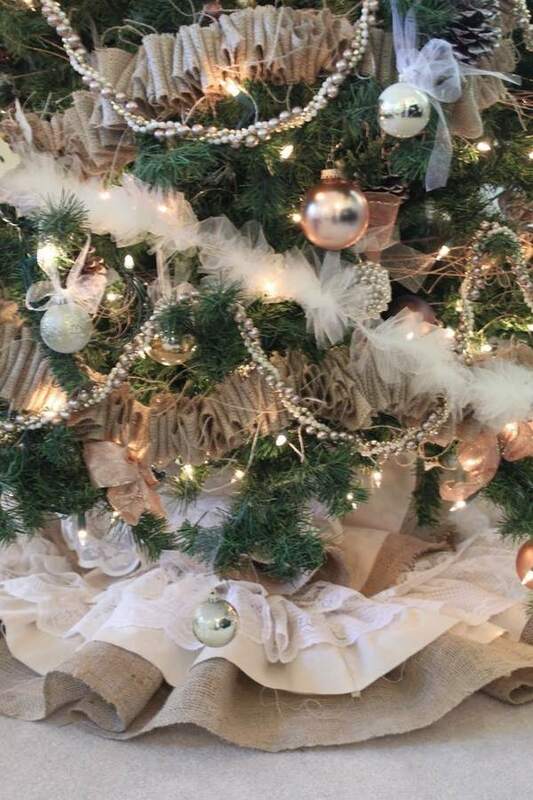 Although we are used to accept burlap as a material for rustic decorations one should not limit himself and even in a city apartment, it will also perfectly fit into the interior, bringing the atmosphere of a fairy forest. 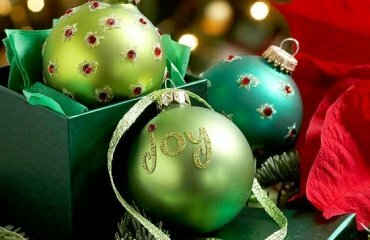 Another great advantage of the fabric is that it comes in a variety of color options – you can choose its natural color or opt for the traditional green and red Christmas colors, you can even combine colors so that you have more joyful decorations. 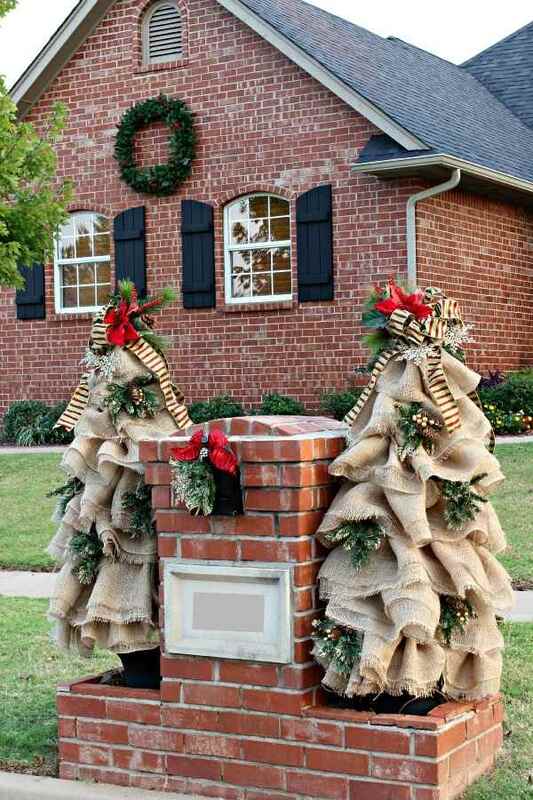 Add beads, glitter, lights to make your burlap Christmas decoration even more eye catching. 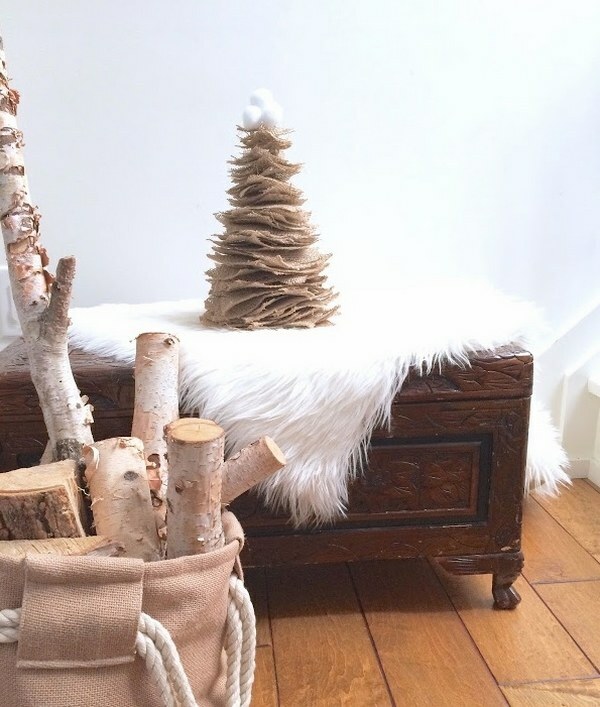 DIY Burlap Christmas tree ideas are different but most often they feature tabletop Christmas trees or mini pines which decorate the mantelpiece, the console table in the entry hall or a side table in the living room. 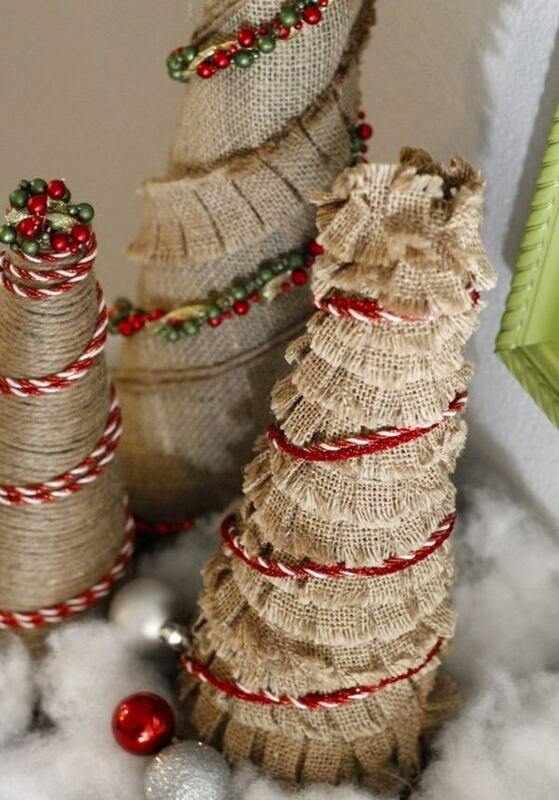 The good thing about burlap Christmas trees is that you do not have to make them look crisp and sleek. 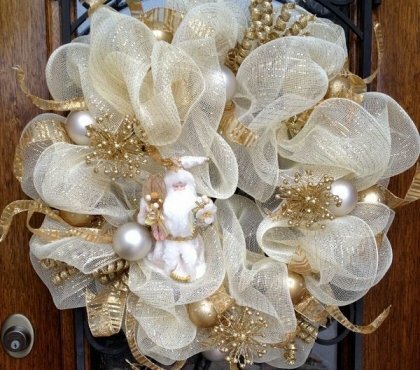 On the contrary, they can have a vintage flair, a certain Shabby chic look which reminds of the romantic time of the past eras. 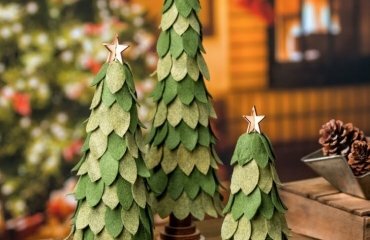 Crafting a burlap Christmas tree will take you about a couple of hours and if you feel crafty on a Sunday afternoon, this is a great DIY project for you. 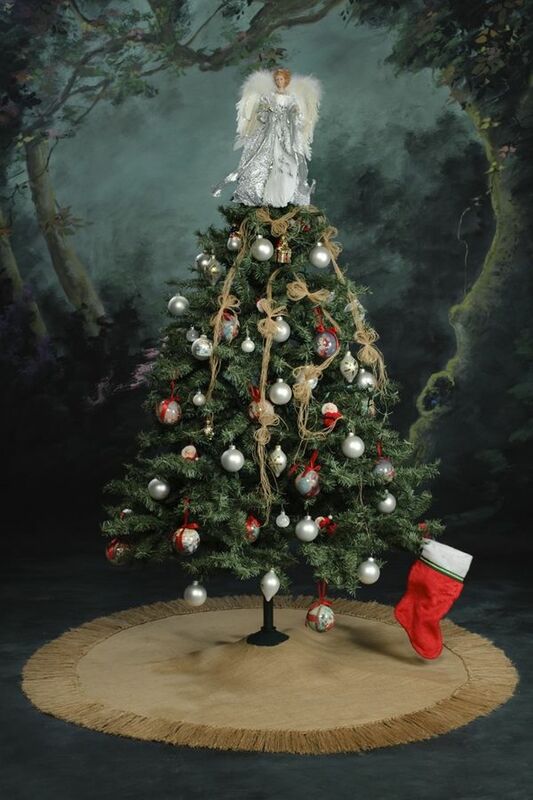 You can even make two or three pines and group them together for a greater visual appeal. 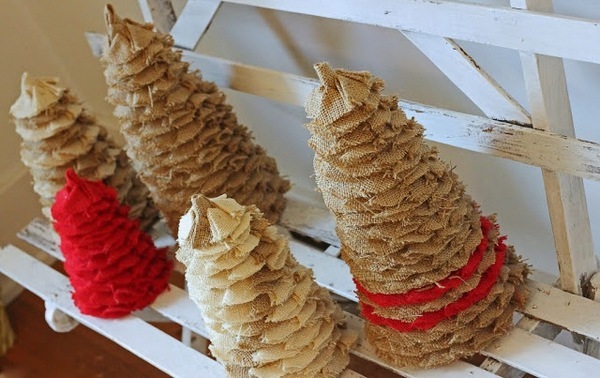 Step 1 – Cut a long burlap strip and glue it with a hot glue gun around the bottom of the cone. Cut strips of about 1 inch wide and 4 inch long which will be used to make the tree. Step 2 – Fold the strip so that the ends cross over each other and fix with the hot glue gun so that the ends stay together. 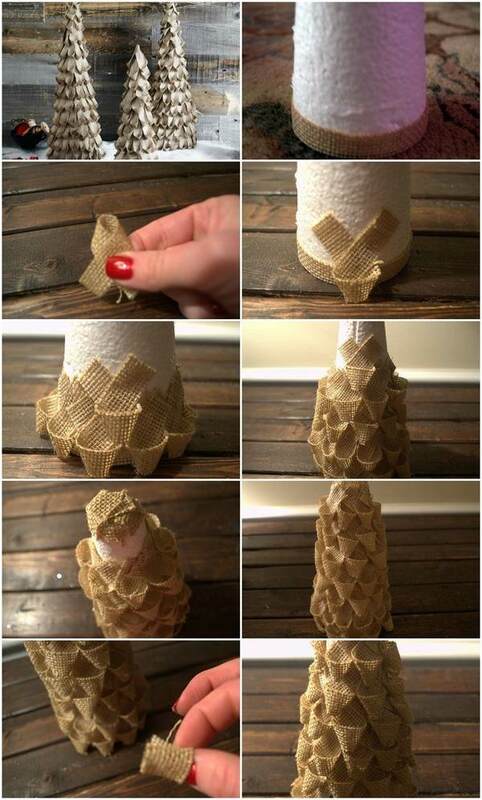 Start fixing each strip to the bottom of the cone until you complete the bottom row. 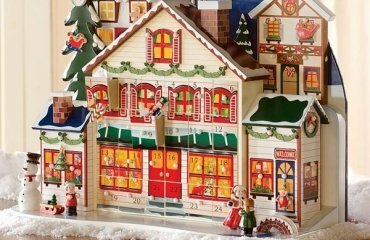 Continue with the second row and glue the pieces in between two pieces on the bottom row. 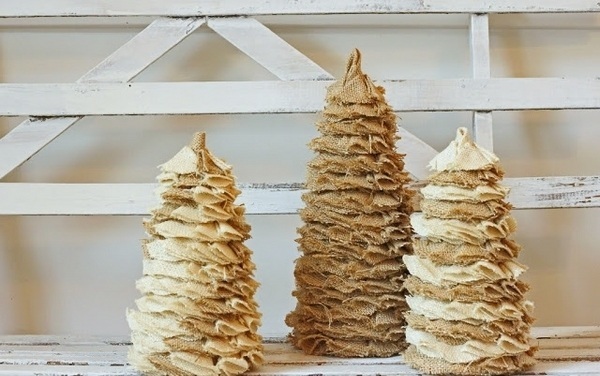 Keep on gluing around the cone – be careful to position each row correctly – in between two pieces on the bottom row. 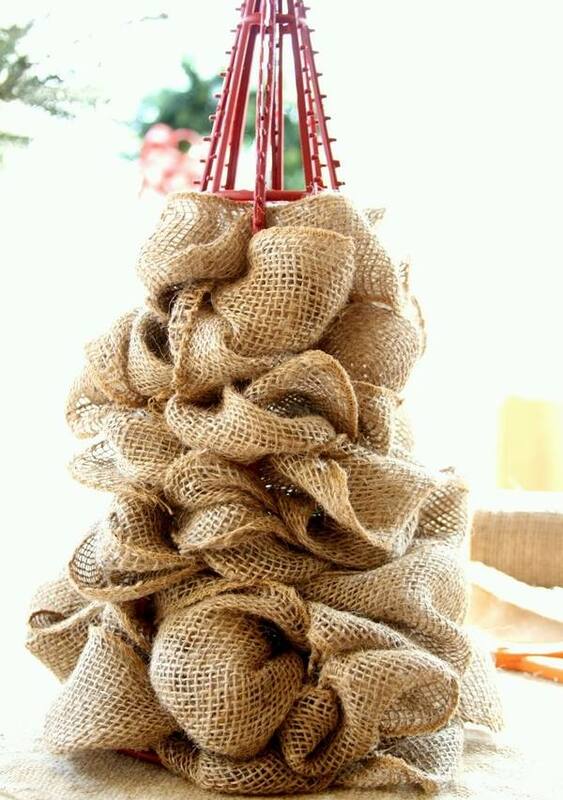 Step 3 – Before you reach the top, cut a few little pieces of burlap and glue them on the top. Then add the final row of strips. 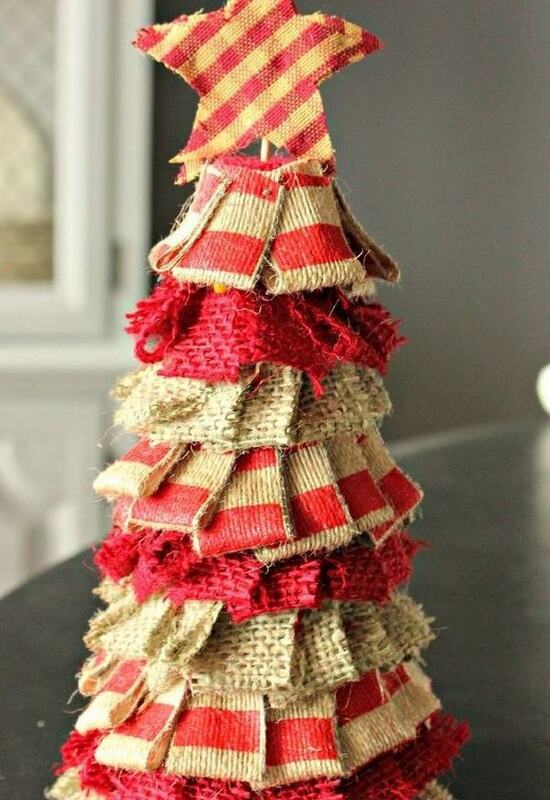 To top your burlap Christmas tree – cut a small piece of fabric and glue it as a loop. Glue it on the top of the cone. 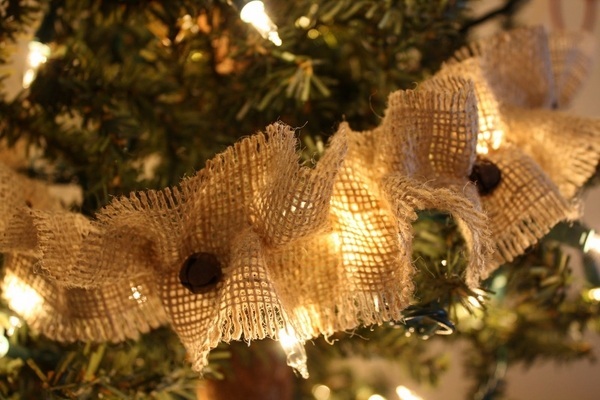 Look at these amazing DIY Burlap Christmas tree ornaments ideas. 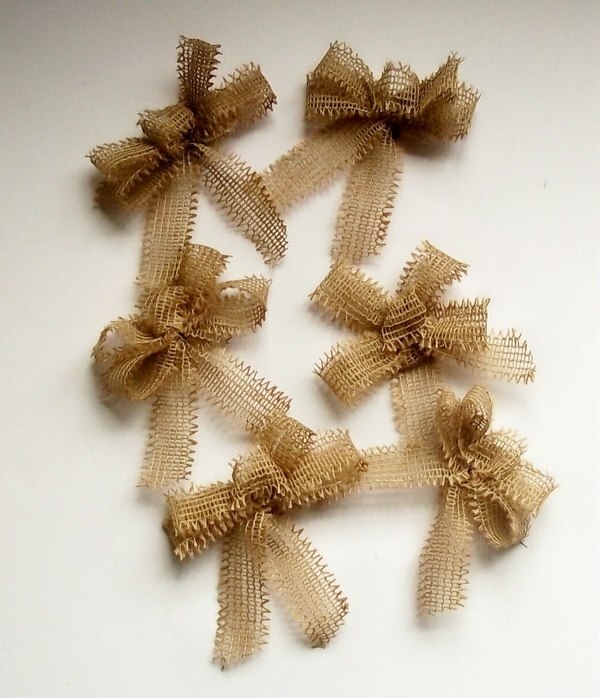 The material can be combined with other fabrics like lace, buttons, feathers, pine cones, slices of dried fruits, etc. 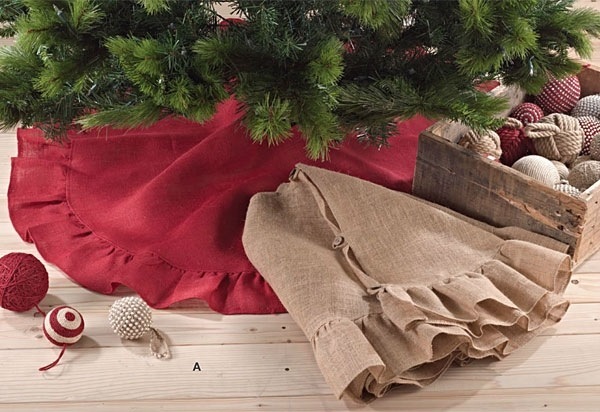 Many experts say that natural fabrics have their own aura and the ability to influence a person’s life, to prevent negative energy and bring comfort and burlap is considered as a “warm” material. 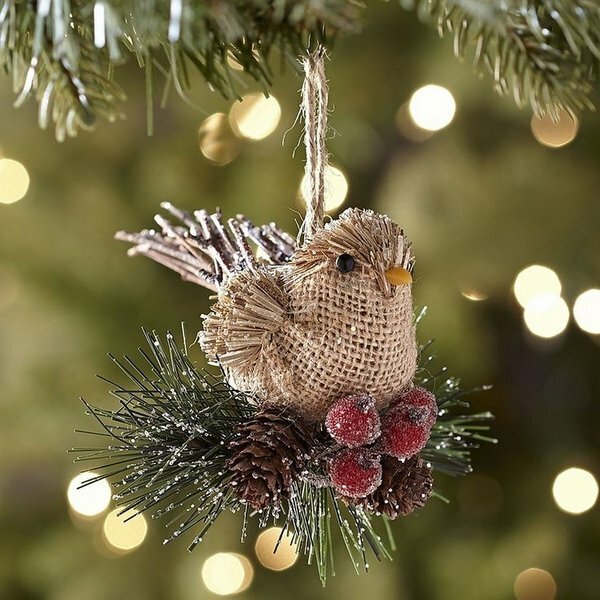 The growing trend for nature preservation and using natural materials as much as possible makes burlap Christmas tree ornaments and decorations especially popular and fashionable. 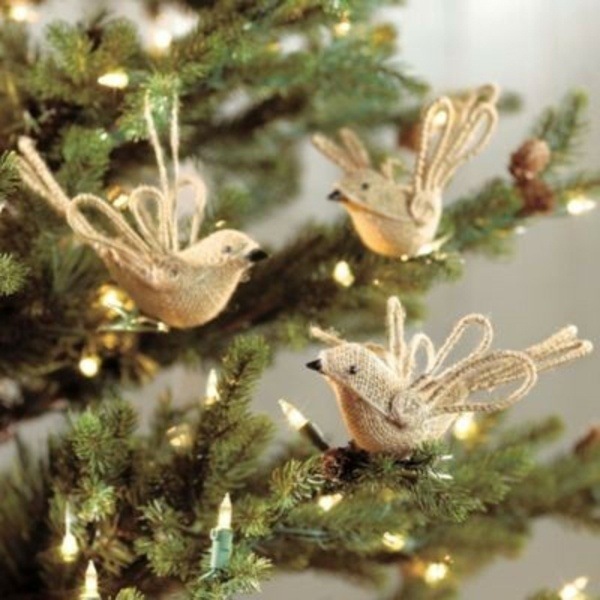 It is obvious that the trend is to replace plastic ornaments with ornaments made of natural materials. 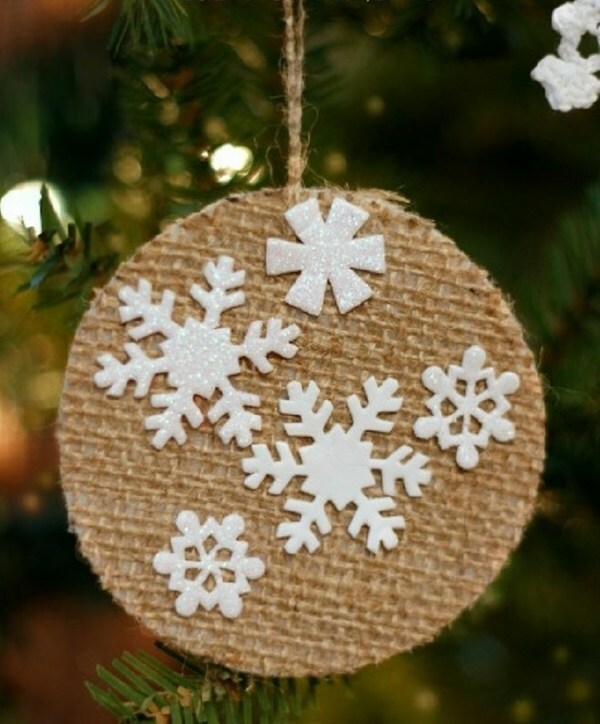 You do not have to be a great designer or an artist, you do not even have to be very skilled to make your own handmade burlap Christmas tree ornaments. 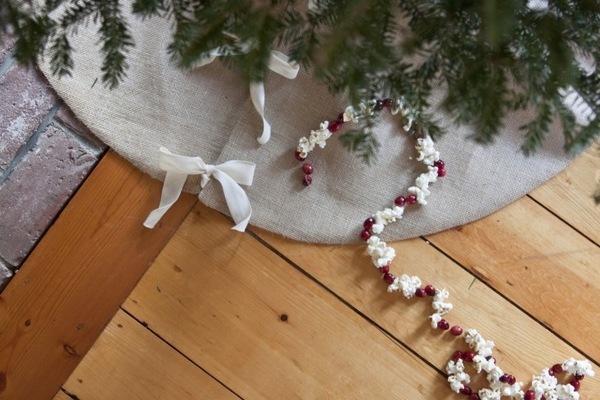 Those who are not gifted at sewing can buy a few natural fabric ribbons in neutral or traditional holiday colors and use them as tree garlands. 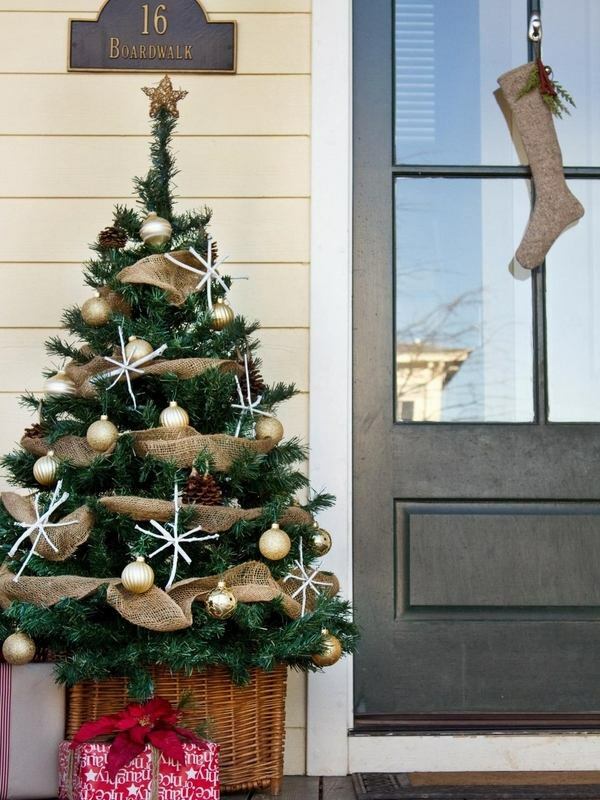 Another very easy idea is to make simple burlap ribbons and decorate the Christmas tree. 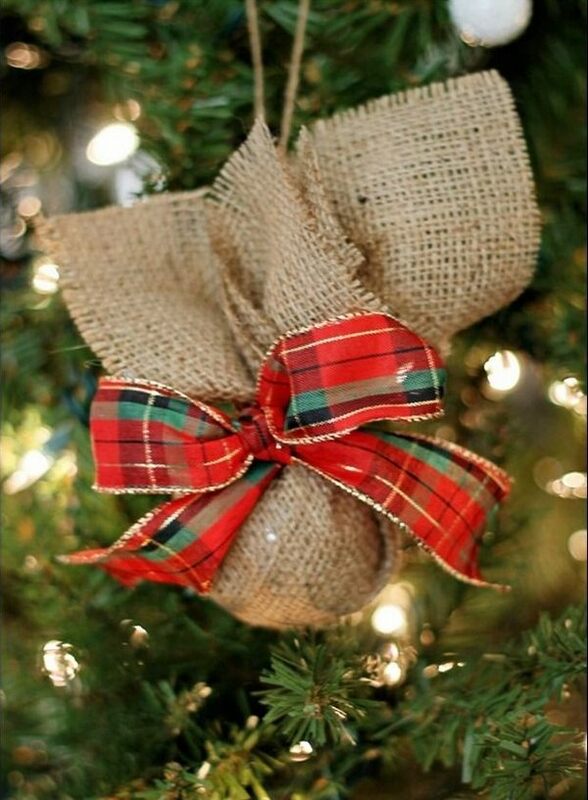 If that is too simple, here is another idea – cut thin strips of burlap and wrap them around Christmas tree balls, add a ribbon and you will have original handmade ornaments. 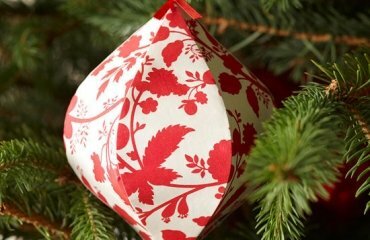 If you are looking for last minute Christmas tree decoration ideas, think of cutting large square pieces of the fabric and just wrap a ball inside. 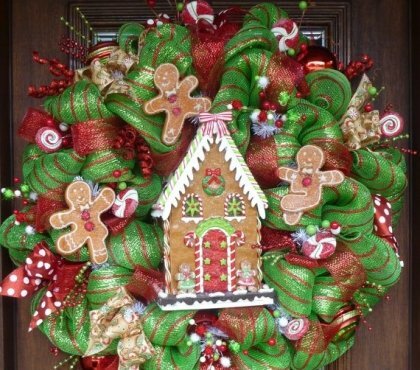 Add a ribbon and your quick and easy Christmas decoration will be ready in just minutes. 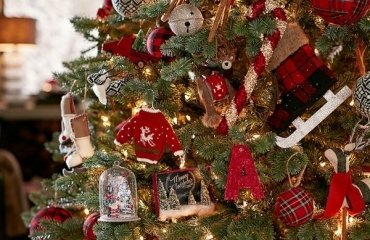 Those who are skilled at sewing can cut pieces of the fabric in various shapes – stars, hearts, Christmas stockings, holiday trees, candy cane cones, etc. 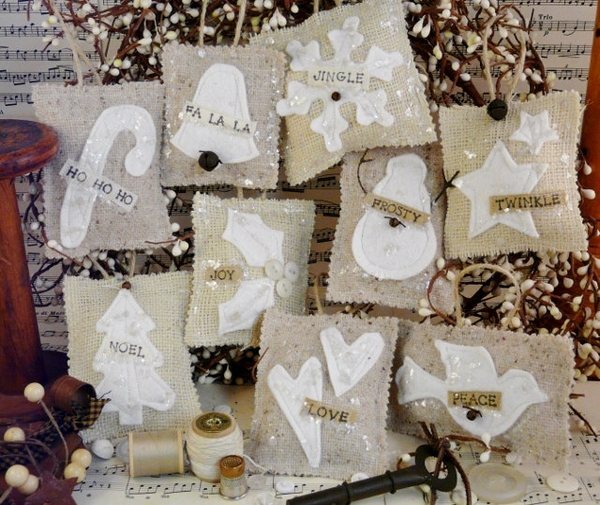 Draw the silhouettes of the ornament on a cardboard, apply the pattern on the fabric, mark the contours with a pencil and cut the shapes. 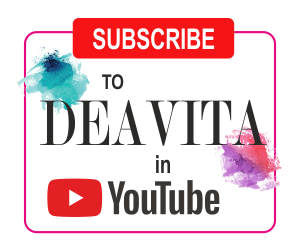 You will need two identical shapes. 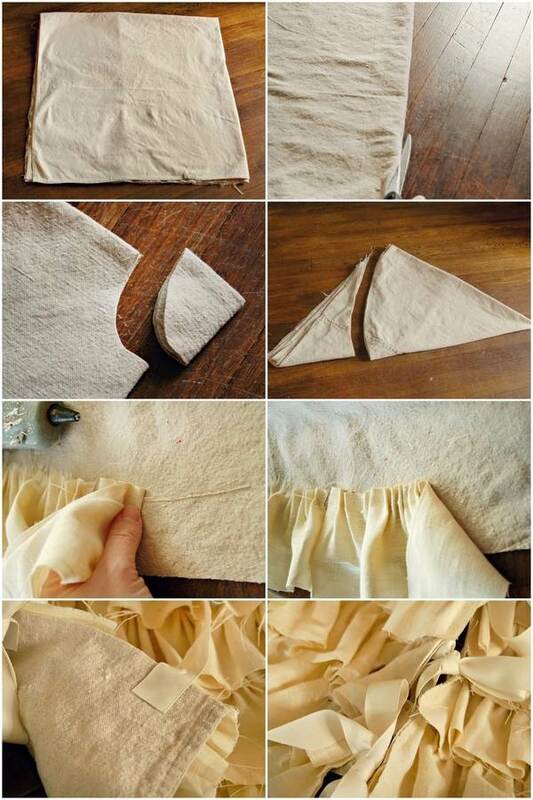 Sew them together partially and before finishing, stiff the inside with some cotton. 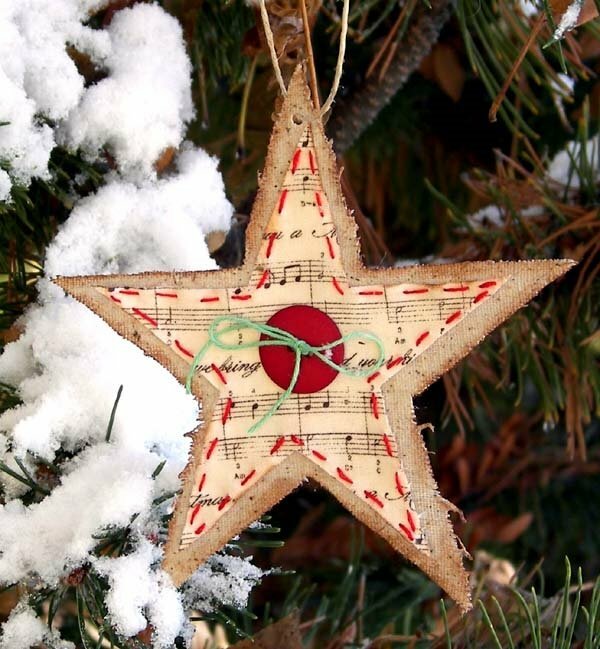 An easier way is to use adhesive to glue the two sides of the ornaments together. 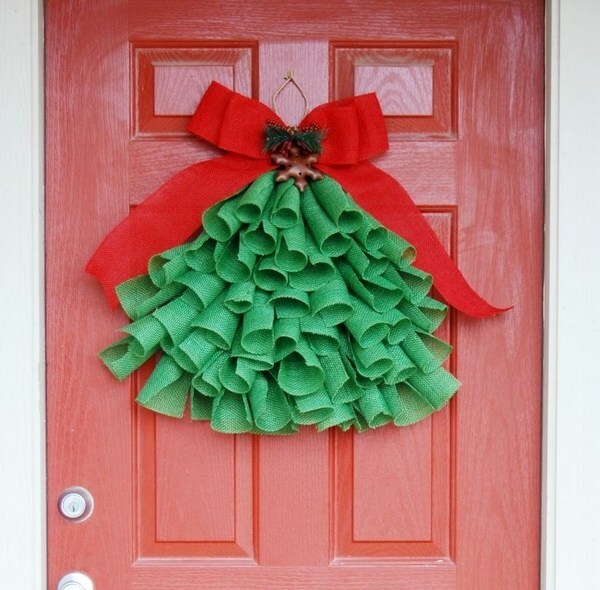 Add decorative stitches, buttons, lace, some colorful fabric, ribbons, glitter, if you wish, etc. 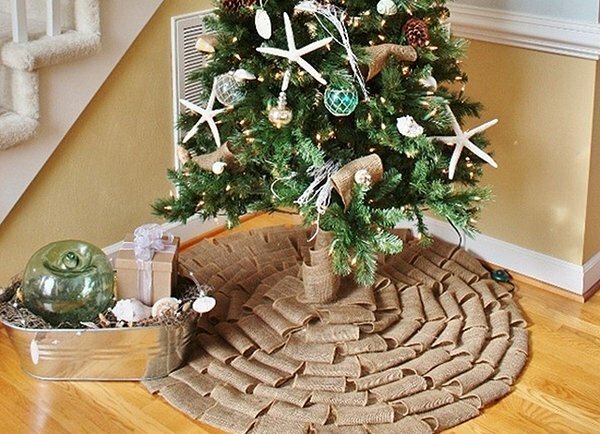 and there you are – you have unique burlap Christmas tree ornaments. 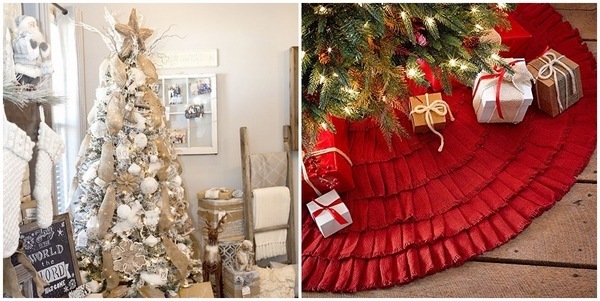 There are many tutorials and DIY Burlap Christmas tree skirt ideas which you can use as an inspiration. 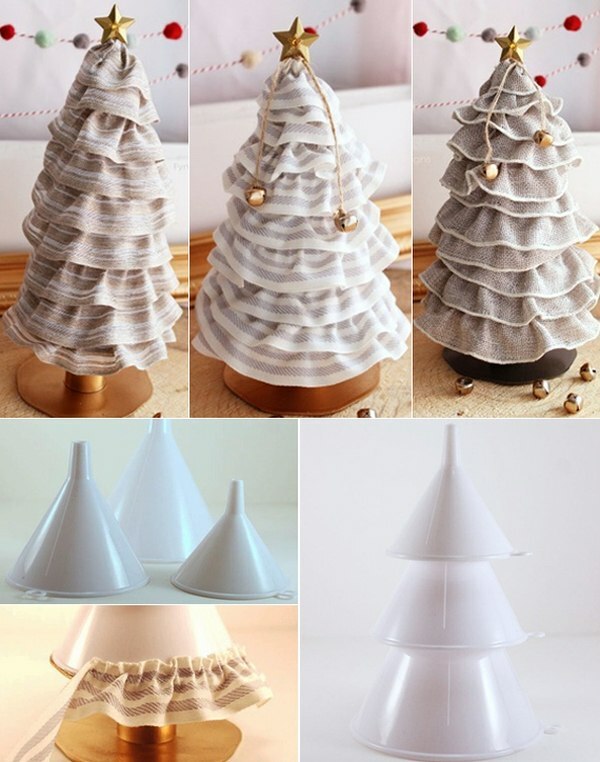 You can choose a simple pattern and just cut a round piece of fabric to use it as a tree skirt or choose a ruffled pattern and craft a unique model. 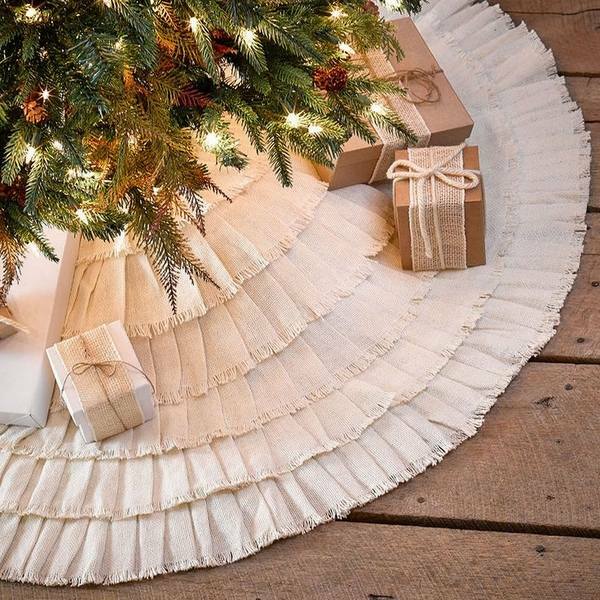 A no sew burlap Christmas tree skirt can be crafted in a couple of hours. You can use one color fabric or choose two colors. 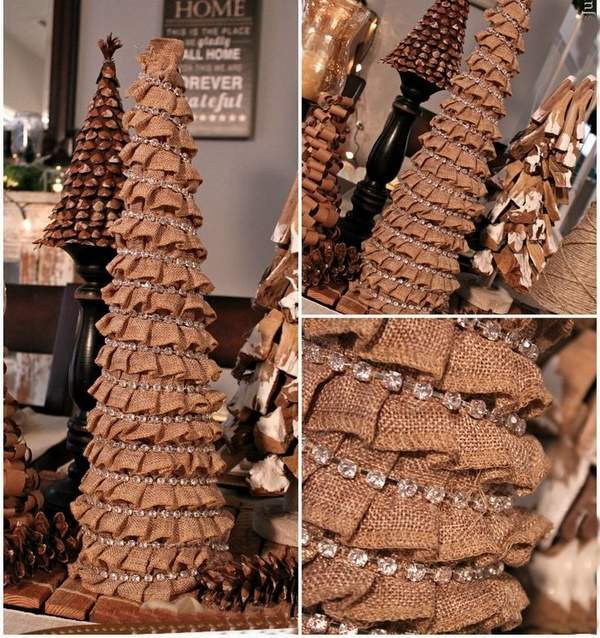 The easier way to make a beautiful ruffled no sew burlap tree is to buy burlap ribbon to have perfectly equal strips. 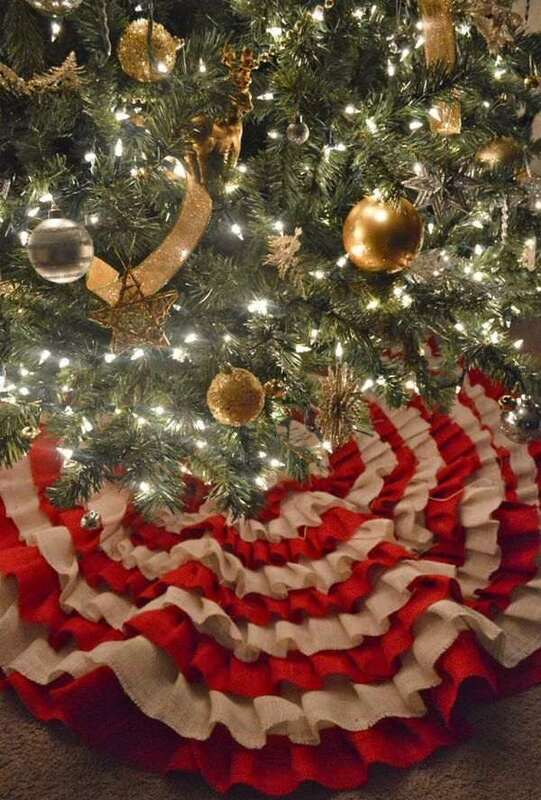 If you work with this natural fabric, you need to cut strips of equal width, a piece of canvas, cut to the desired size which will be the base of the Christmas tree skirt, and a hot glue gun. Step 1 – Measure the canvas, mark and cut a square. Fold the square into quarters, then fold once again to form a triangle with the folded center at point. Cut the base in a quarter circle and a small quarter circle out of the point. Open the skirt until it is folded in half and cut along the radius on one side of the center hole only. 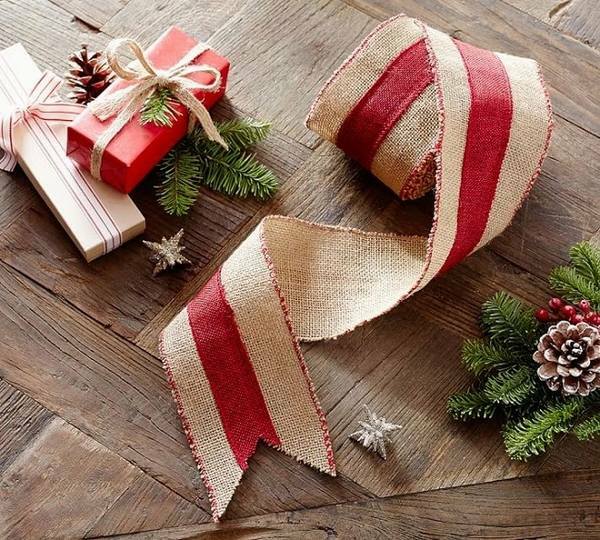 Step 2 – Cut the burlap ribbon or if you use a piece of fabric – cut strips. 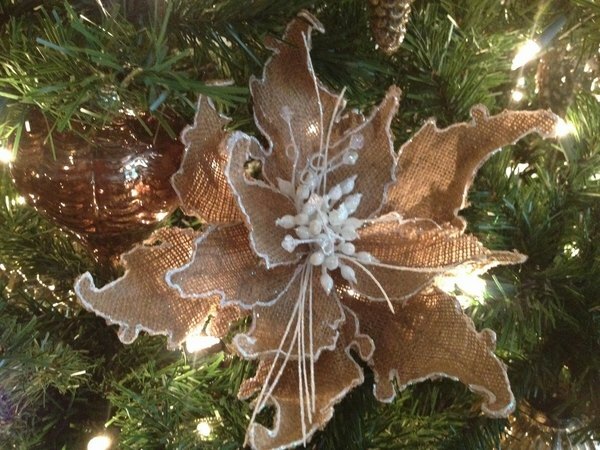 Apply a line of hot glue at about 1-2 inches from the outside edge of the canvas and start making ruffles by simply pinching the fabric and pressing against the hot glue. It is better to work in small sections. Keep on until you complete the entire skirt edge. Continue with next rows and add rows until you cover the entire canvas base with ruffles. Step 3 – Attach ties. 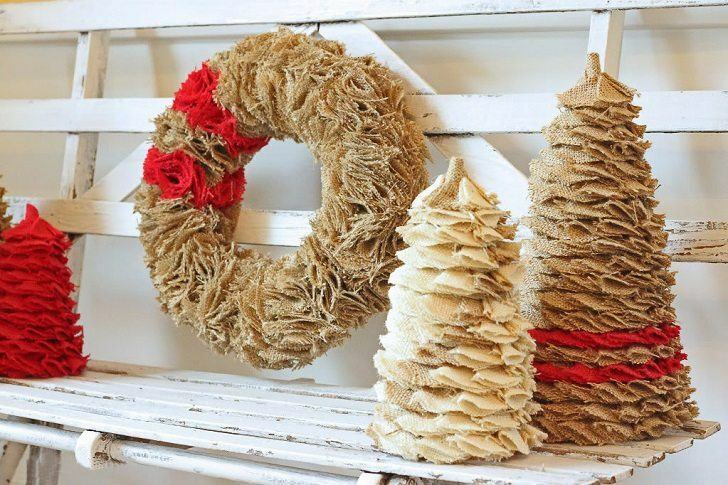 You can use any kind of ribbon, even remnants from the burlap. Fix the ties with the help of hot glue along the slit of the canvas base. 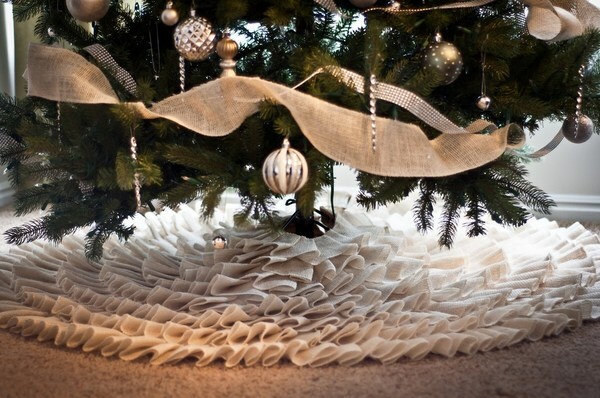 Place the skirt under the tree and tie the ribbons. 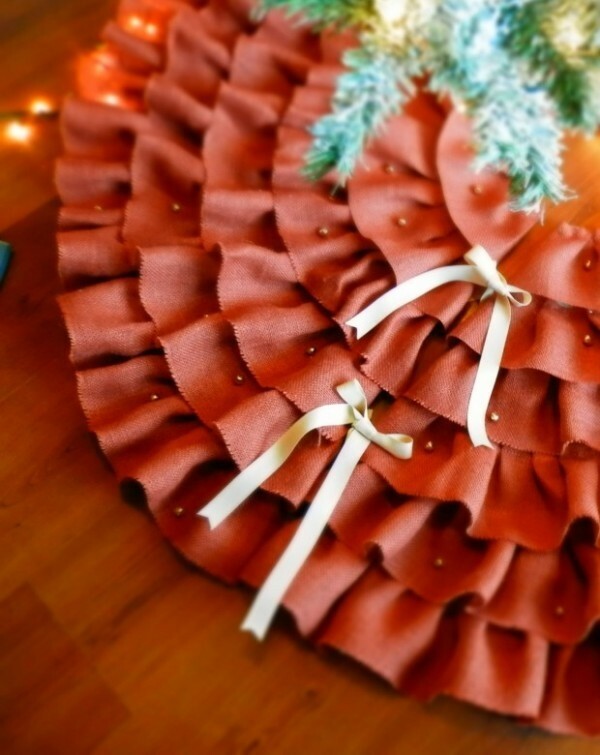 Those who are skilled at sewing can use the same principle, but instead of gluing the ruffles, you can sew them. 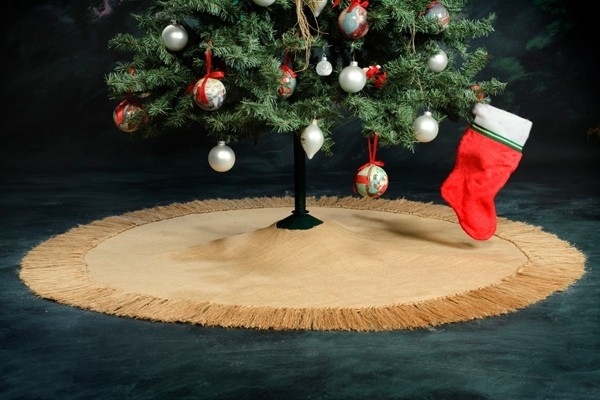 This will make your burlap Christmas tree skirt more durable and machine washable. 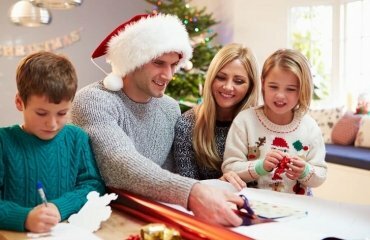 Whichever method you choose you will have a Christmas tree skirt that is beautiful in its simplicity and unique in appearance.